Did you read my last post? Sunstones & self confidence? Warning: I am about to thump my chest like a big hairy beast. Every now and then I make something that even I think is a little too wacky. It didn’t help when the New Orleans Arts Council dismissed my work as “messy” a couple of months ago, and rejected my application to show at the art shows they hold in the park. So sometimes I get insecure. I really need to get over it. I’ve been working on my resurrected jewelry career for just over a year now. I have followers in New York, L.A. and even one in Paris, not to mention my hometown of Montreal and in Toronto. All sophisticated places with styling chicks. The rejection reminded me of 1984 (I hate dating myself like this) when the SNAG (Society of North American Goldsmiths) conference was held in Toronto. I was living and working as a really really young jewelry designer in Toronto at the time. My work was shown in galleries across Canada, but not in Toronto. I did have my pieces in some posh shops for fashionistas, and hot, cutting edge hairdressers often used my earrings in their ads. However, the Metal Arts Guild of Ontario, the self proclaimed deciders of the craft, routinely rejected my work for all the “important” shows. Well, in 1984 I got pissed. 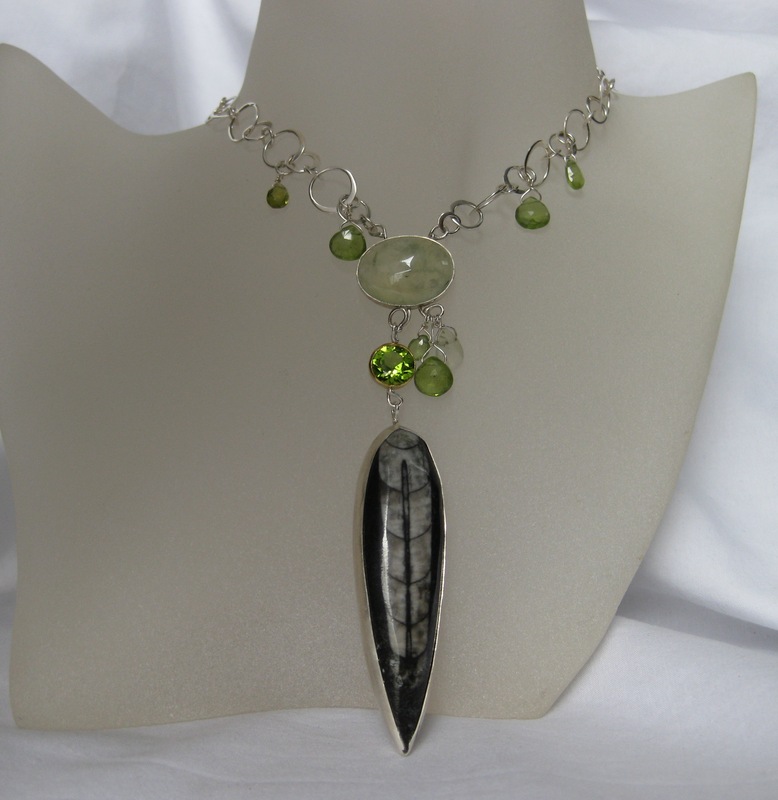 So did a number of other really talented jewelry and metal artists. It was time to make lemonade from these lemons. There was a new gallery in town called NeoFaber which eventually became a well known glass art gallery (it closed a couple of years ago) but at the time they showed all mediums. I approached them and they agreed to give me and the other rejects a “Salon des Refuses” venue. I even got a Canada Council grant for the expenses, and named it “Crowd In A Silver Lining”. To make a long story short, our little show got the most publicity, and this was way before the internet or twitter. We were written up in the daily paper, the weekly arts & entertainment paper, and the local TV station did a segment on the news! Opening night was a raging success and I felt vindicated. I did get a huffy call from a member of the guild wondering why THEY weren’t “consulted”. Some people have a lot of nerve, but I never got a rejection from any Metal Arts Guild shows after that. My one Parisian “follower” is tres chic. She collects and sells antiques and all kinds of finely crafted pieces. Her bio includes 10 years of buying luxury goods for the American Embassy in Paris. She has a house in New Orleans filled with amazing chandeliers (hand blown in Italy, where else?) and stunning furniture. Last month, she arrived for her annual visit. She’s been an enthusiastic supporter of mine from the beginning, offering suggestions for enhancing my work and business whenever she feels I need a little direction. I always look forward to seeing her. Usually I just show her my finished pieces, but after a couple of glasses of Champagne (courtesy of my Parisian friend) I bravely brought out some of the Wanga pieces I’d been working on. “This might be too wacky ” I say, “It’s not finished, but I’m going to add a green leather cord like this, and make some end tabs that look like this…”. My collector friend ordered two. I’m so very grateful that the people that count (my friends, clients and various jewelry junkies) support my unusual ideas for making baubles. I love it when my wacky “magical” pieces are received not as “messy” but more, um, enchanting, interesting, unique. I want to pique your interest, tell a story. The pieces on their way to Paris are wonderful magical talisman necklaces. 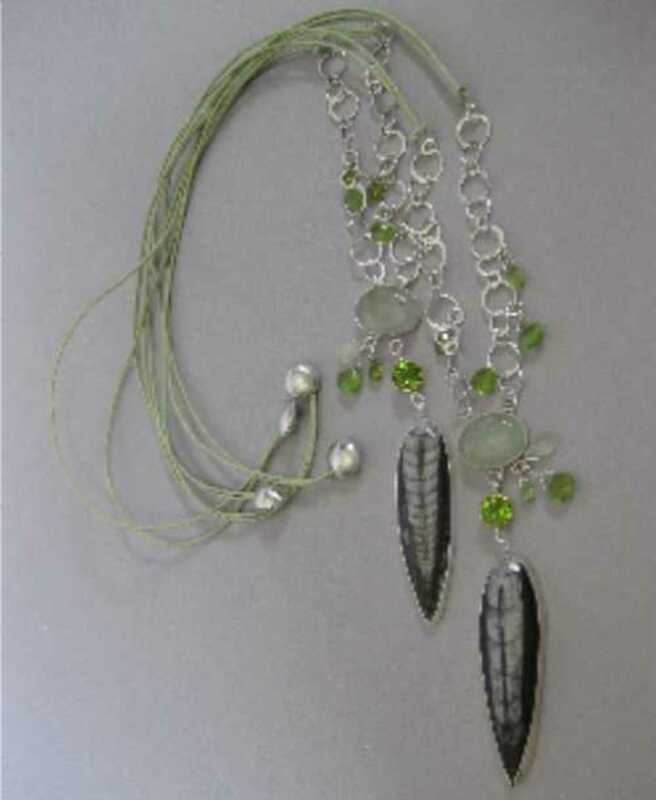 Made with orthoceras, peridot, prehnite and set in gold and silver. Prehnite is the stone of remembered dreams and unconditional love. It connects the will and the heart to bring the highest good. 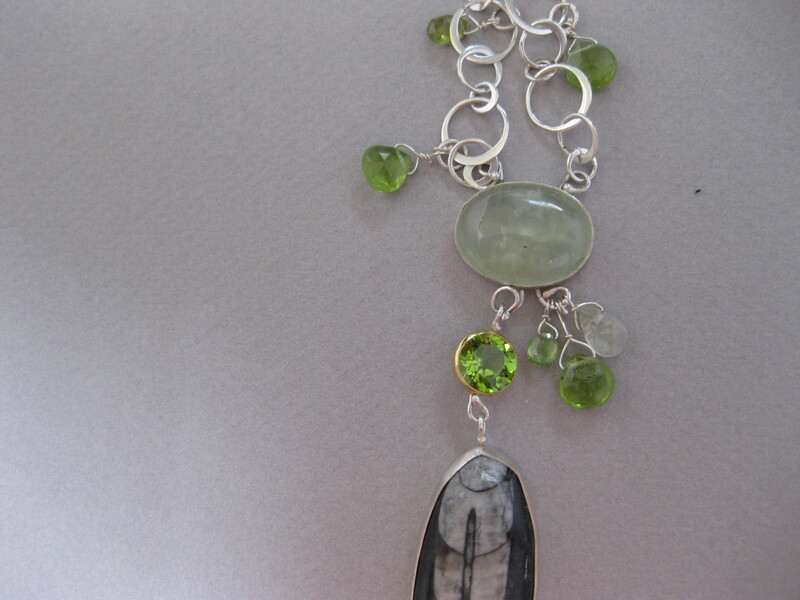 One wears prehnite to trust ones intuition and recognize the truth. Let’s just say it’s been pretty good for me! Although it’s a cliche to say, I’ll say it anyway, because it’s true: New Orleans is a very inspiring place for creating almost anything. It’s violent and magical with a fascinating deep dark underbelly. Achingly beautiful, crumbling, a chaotic combination filled with perfume. It’s fetid, charred and blackened, bloody and muddy, practically “messy”. I have to stop hoarding. I love my rocks, but I bought them to create jewelry, to share the beauty. I need to learn to let go, be less selfish. SHARE. 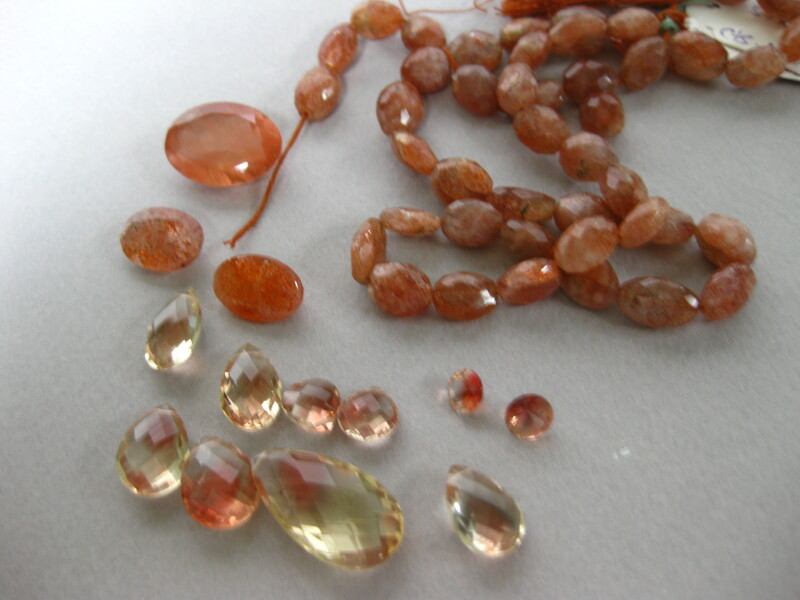 Considered “magical”, sunstones make for wonderful talismans. One of the sunstones I pulled out is particularly luscious. It’s a huge Oregon sunstone, 14 carats (!) I like that already, but it also has a wonderful “schiller”, a thin opaque copper sheet (like a copper colored mirror) that I think is breathtaking. 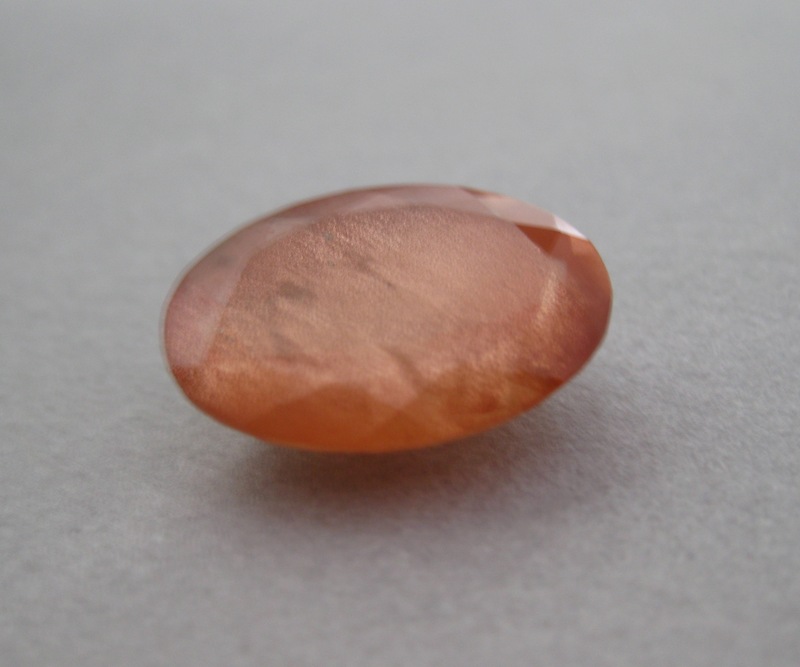 Oregon sunstone contains copper crystals, unlike sunstones from other parts of the world which usually get their color from iron, so the color is slightly different, very beautiful. This is the stone for “vitality”, the stone that helps enforce the body’s healing energies. It is protective, healing and encourages success. Need a boost of self confidence? Sunstone will have you thumping your chest like a large hairy beast. We’ll know who’s in charge. This luscious sunstone is practically an inch long, and it felt like it needed to be in a “Wanga” piece. Wanga is a magical charm, or spell (See the post: That Old Black Magic, where I started with the idea). So it needed a fossil. I love fossils. For me, they represent our ancestors, and sunstone represents life. Here. Now. Vibrant. Vital. 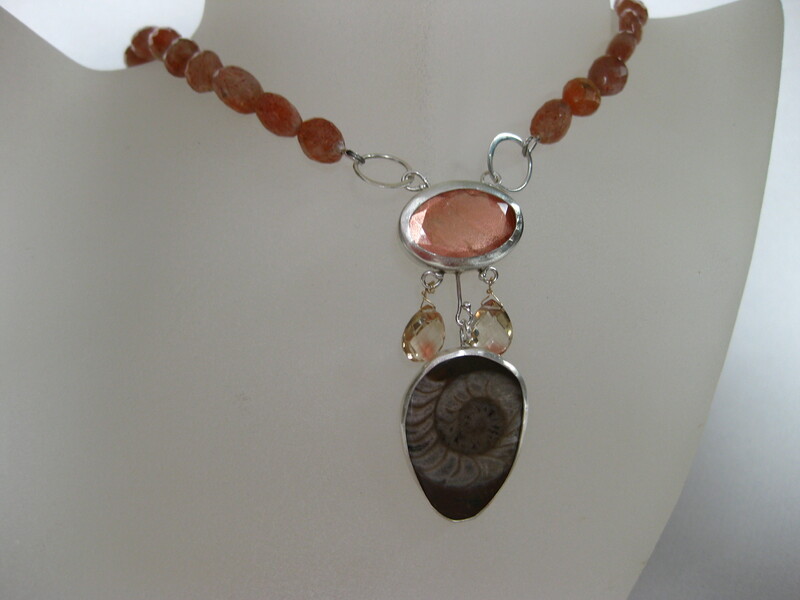 Ammonite is a symbol of the unending spiral of life. It has absorbed the energies of the universe, the five elements of Water, Wood, Fire, Earth and Metal, and holds the power of wisdom. 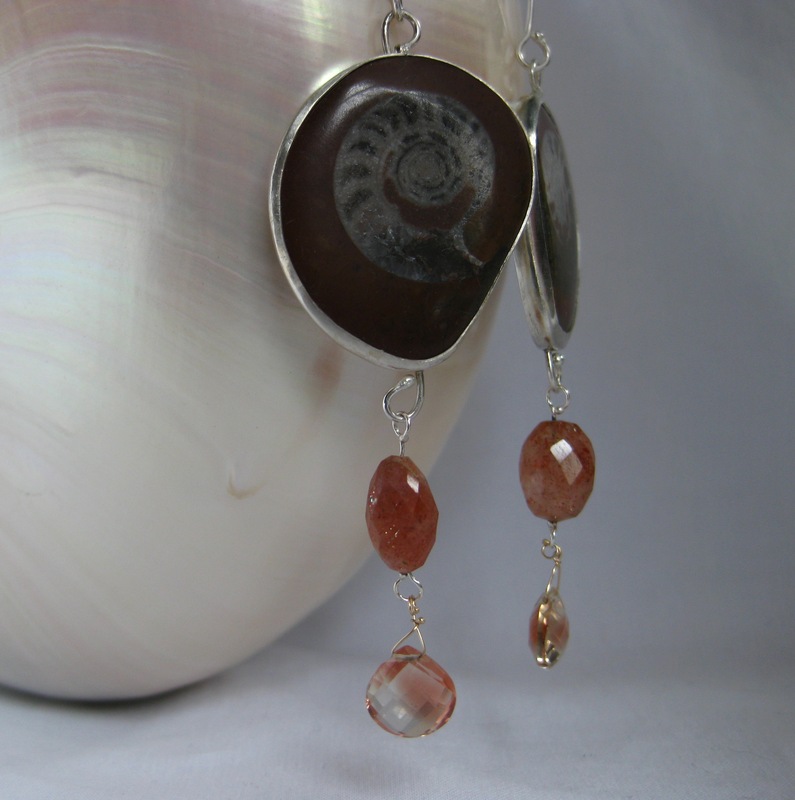 It hangs on a strand of faceted “nugget” sunstones (from India), and shares the spotlight with an ammonite fossil, and two Oregon sunstone briolettes. I’ve been thinking a lot about water lately. Usually it’s in the form of “hope the levees hold it in” type of thinking. But lately, the fires in Colorado have spurred me to send watery thoughts in that direction. I understand the angst and the pain of loss; a devastating experience. Harnessing the energy from anything (fire, wind, water) and using it wisely is always a trick. Dealing with the aftermath is a bigger challenge. Quelle surprise that I’ve been playing with aquamarines more than usual lately, and revisiting some of the aquamarines in my rock collection, and in my finished pieces. Some aquamarines in my rock collection. 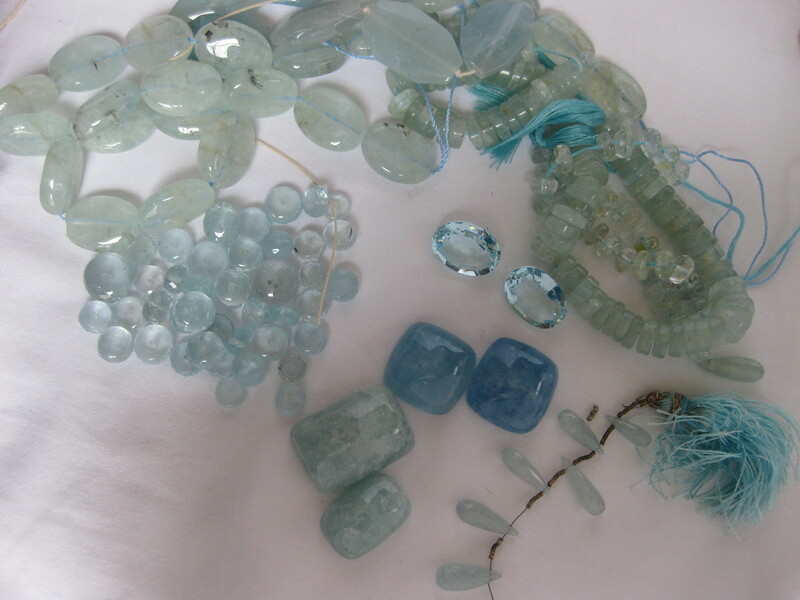 The aquamarine gets its name from Latin: “water” and “of the sea”. Apparently, (and I like to believe this) aquamarines originated from mermaid’s tails, they were referred to as the “treasure of mermaids” with the power to keep sailors safe. 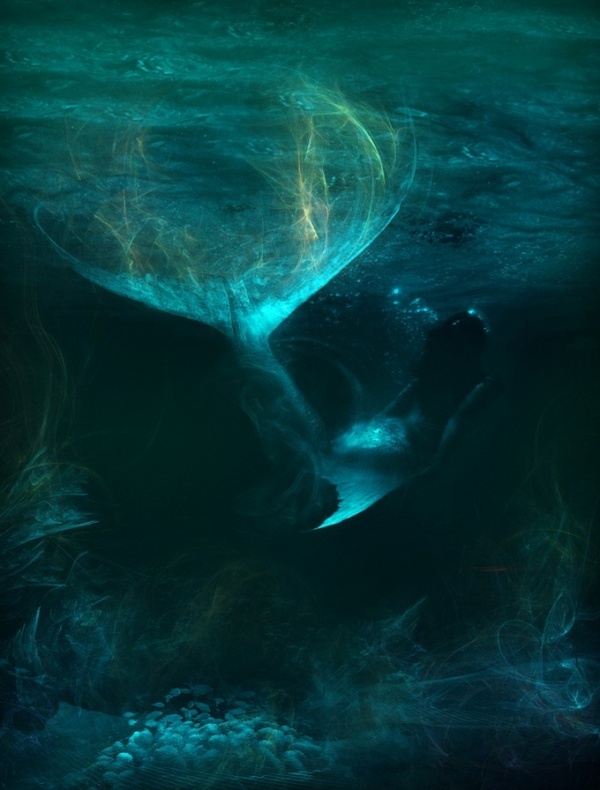 Last month the National Oceanic and Atmospheric Administration (NOAA) released a statement that mermaids “do not exist”. Well bah humbug. Next they’ll be picking on the tooth fairy, or the sandman. I have written before that aquamarines are a symbol of peace, promise a happy marriage and bring the woman wealth and joy. In addition, they bring courage, and in advanced meditation, wisdom to see the truth. 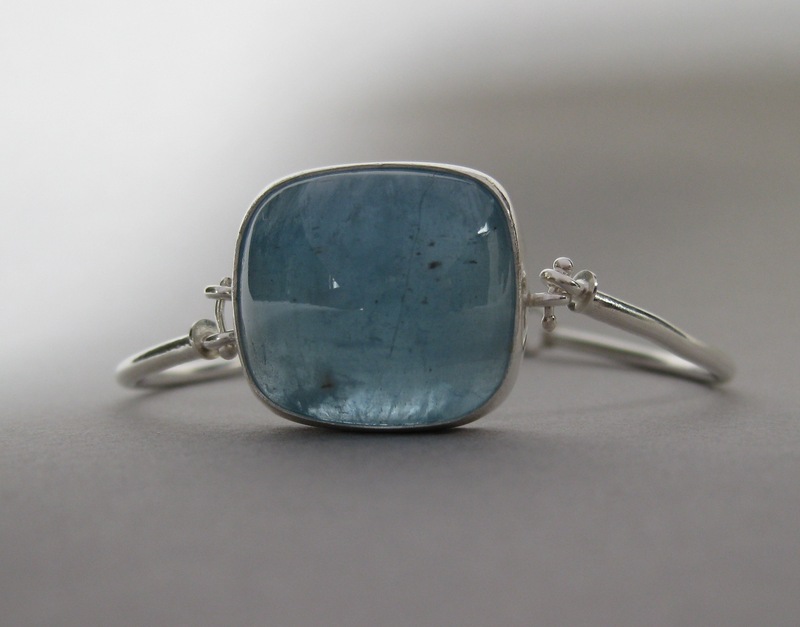 31 Carat Aquamarine Cab Bracelet. 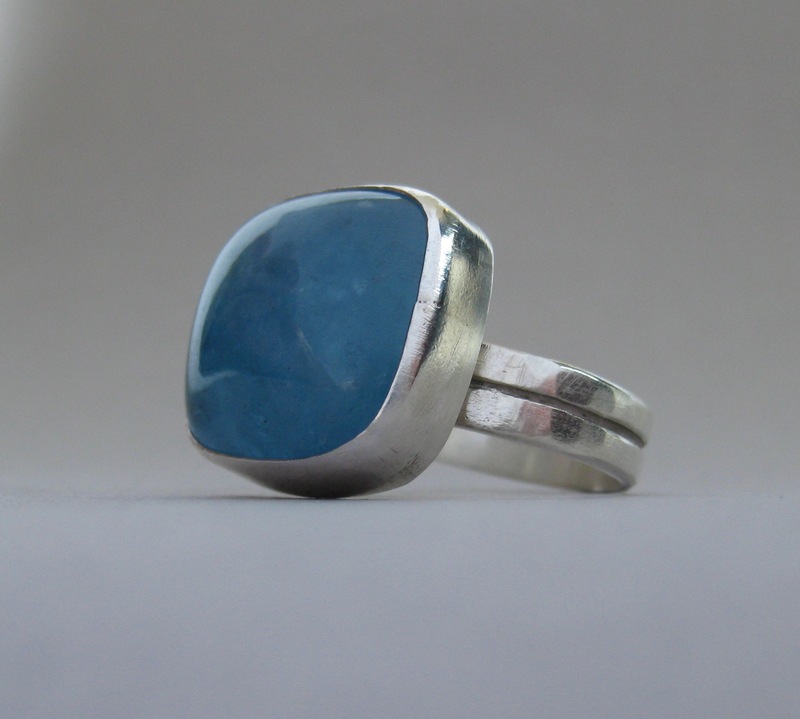 18 Carat Aquamarine Cabochon Ring. 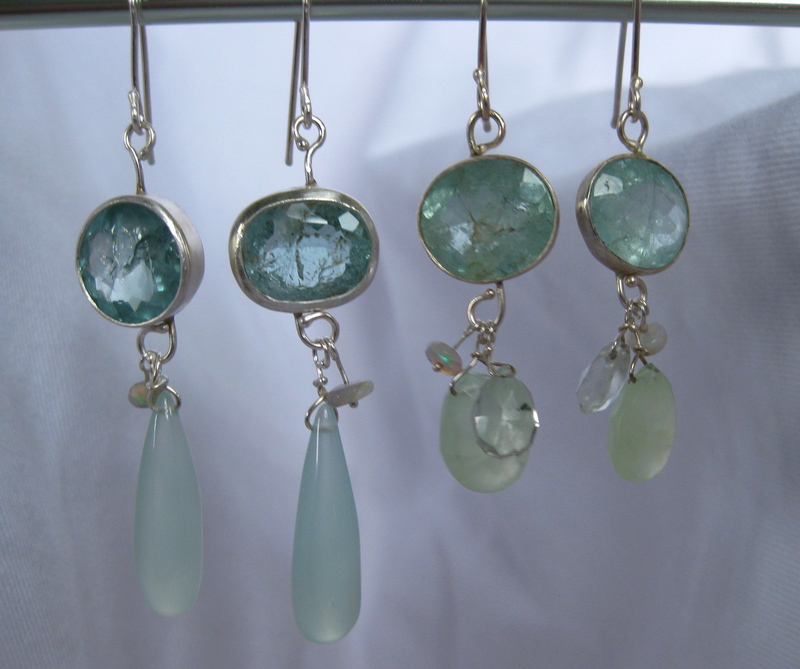 Rose Cut Aquamarines with Aquamarine and Emerald Briolette Drops. 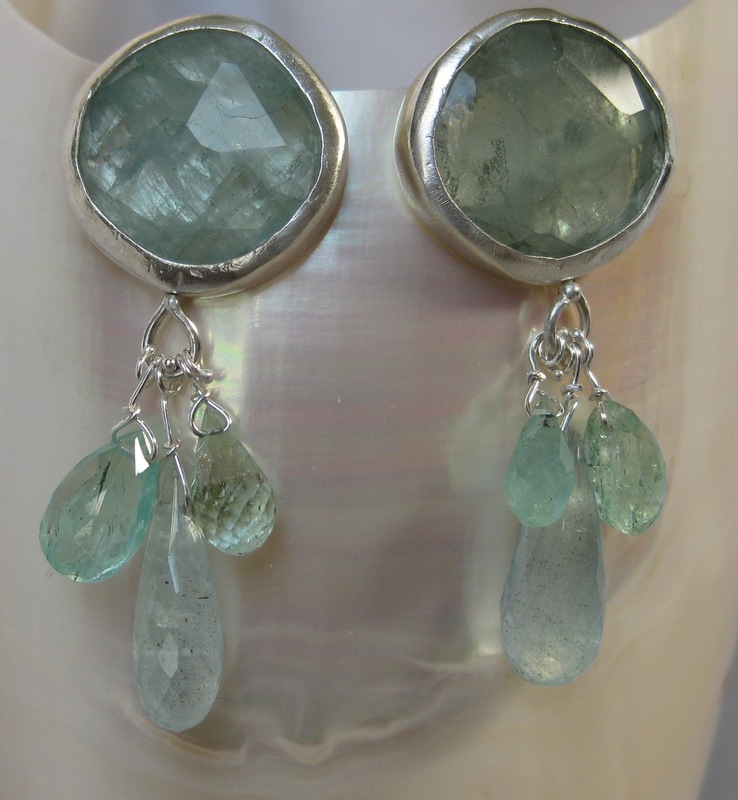 Santa Maria Aquamarine Earrings with Assorted Drops. 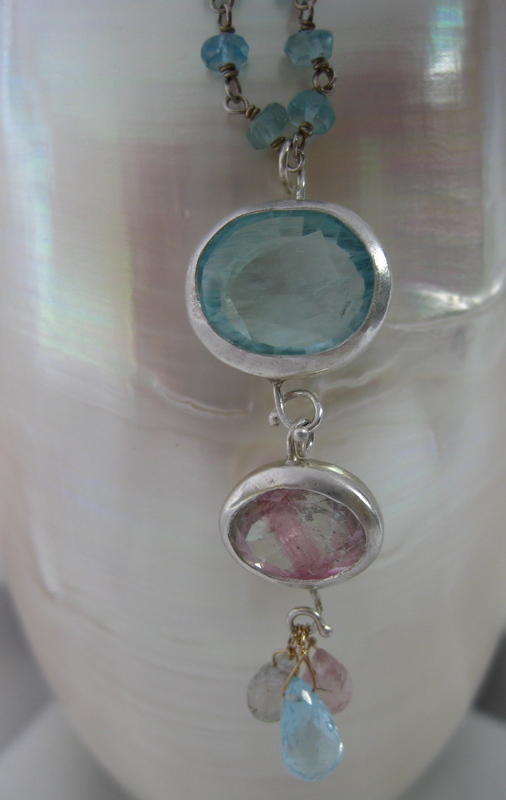 Santa Maria Aquamarine Pendant with Tourmalines, Apatite & Sterling Chain. 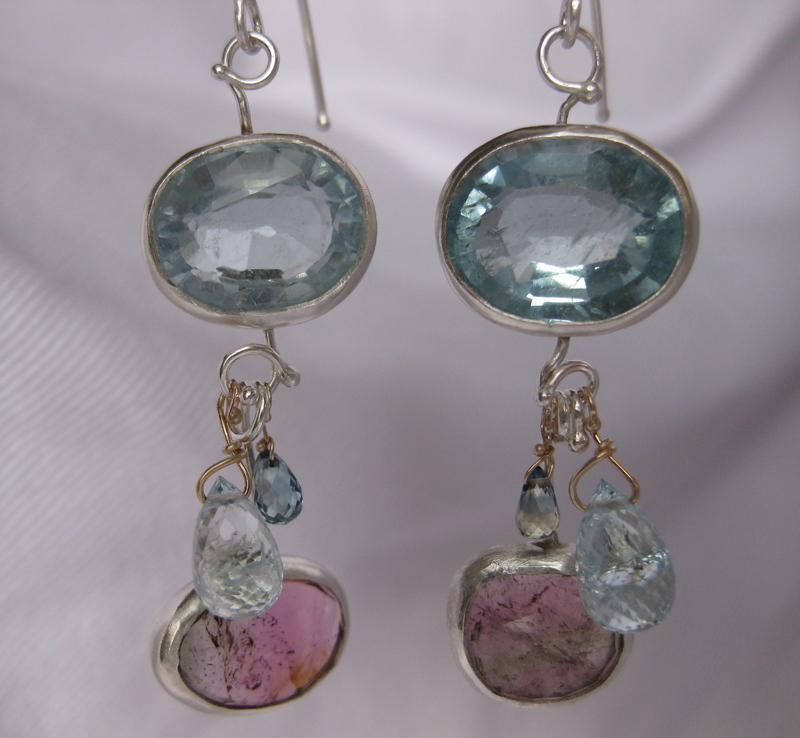 Santa Maria Aquamarine Earrings with Tourmalines & Sapphires. I send the good people of Colorado and Utah watery blue aquamarine energy for peace and courage. 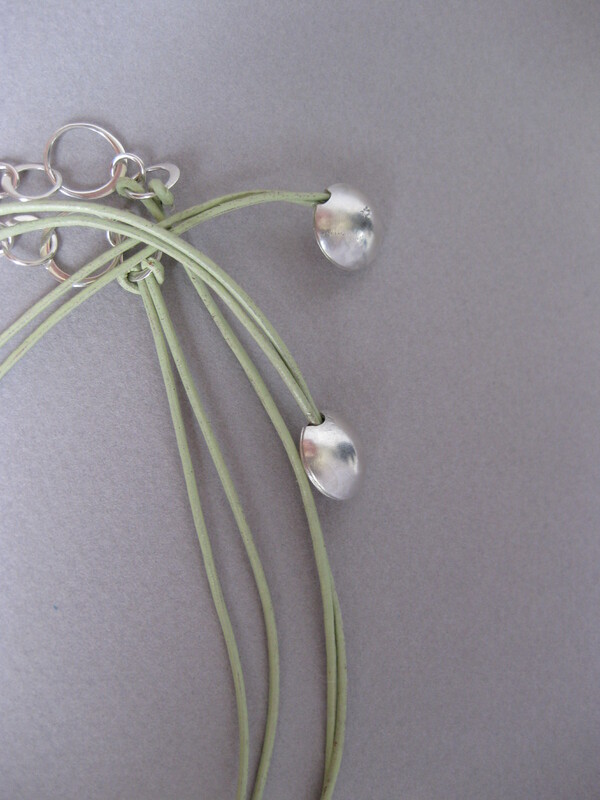 You are currently viewing the archives for July, 2012 at ledajewelco.